Pune: Bengal Warriors produced a memorable comeback to beat Bengaluru Bulls 44-37 in Pro Kabaddi League in Pune on Thursday. Maninder Singh was the star man for Bengal Warriors as he scored 17 raid points to lead his team to victory. Ravindra Ramesh also chipped in with eight crucial points for the winning team. Bengal Warriors trailed by 7 points after the first half but inflicted three all-outs in 12 minutes to complete a brilliant comeback. Bengal Warriors defence also had a strong game in the second half to contain the Bengaluru raiders. Bengaluru Bulls are winless against Bengal Warriors this season in the Pro Kabaddi League. Rohit Kumar and Pawan Sehrawat began brightly to give Bengal Warriors a 4-2 lead in the fifth minute. Bengal Warriors’ reliance on Maninder Singh was getting exposed as he was the lone scorer for them in the first seven minutes of the match. 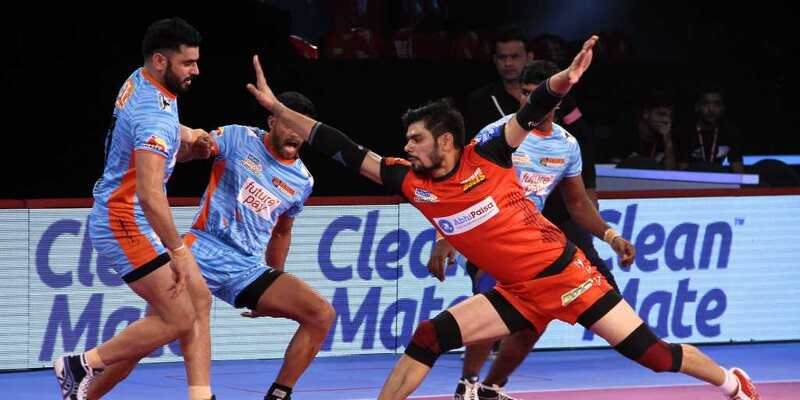 Bengaluru Bulls inflicted the first all-out of the match in the 7th minute to lead 10-2. Maninder Singh scored his third raid point in the 10th minute as Bengal Warriors trailed 3-13. The Warriors inflicted an all-out in the 22nd minute to trail 16-21. Bengal continued to get points as their defence got their act together and Maninder picked up the raid points. The deficit was reduced to just two points after 23 minutes and Bengal Warriors looked in ascendancy.